Beautiful piece of furniture. I love it. My blanket box arrived at 6.30 am yesterday morning! The drivers did text the evening before to check I was happy with such an early delivery time and I was. The delivery guys were very polite and friendly. I bought the blanket box to fill in a space in my study. It looks lovely and is well made . Fabulous piece of furniture, great quality and love the soft close feature on the hinged lid-stops our children getting their fingers caught! Communication was excellent and delivery was all as promised. Lovely product and very pleased! Really pleased with this, we bought this to use as a toy box for my little girl as it matches perfectly with our oak furniture in our living room. Great quality and the slow close top is fab for preventing trapped fingers. Highly recommend. 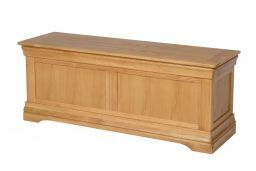 We have just purchased another two of these wonderful blanket boxes. Really well made , easy to care for and are eye catching pieces of furniture. So many people have commented on them. We live in a stone cottage where storage has been an issues so these are a much needed item. No hesitation in saying they have been one of our purchases of the year. ! This was perfectly packed to prevent damage. 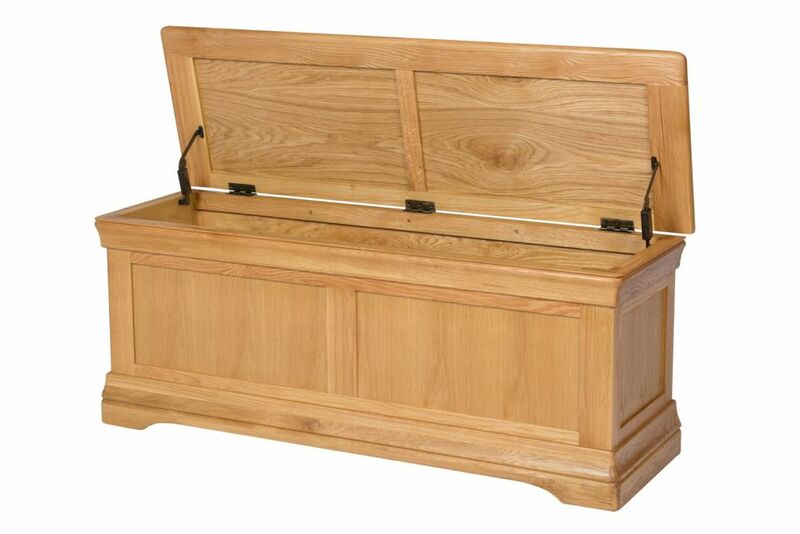 The blanket box is very good quality and looks lovely at the end of the bed. The blanket box arrived bang on time which was greatly appreciated. Very nice delivery which was such a change. Part of the rungs between the feet had small chips out of the wood which was a little disappointing. Noticeable that those two areas were the only parts not protected. It's a good, solid oak storage box with lots of space. Absolutely love it. Beautiful piece of furniture, well made, lovely wood and practical as well as beautiful. Excellent value for money. Well constructed and very good finish. Perfect. Well made, good value and good delivery service. 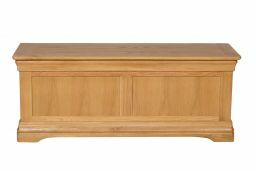 i have now purchased a massive oak dining table new chairs bed side tables and the blanket box all great quality cant be happier ! We've been looking for attractive ways to store duvets and pillows etc in our cottage. This fitted the bill perfectly- couldn't be more please. It looks well made and several of our friends have remarked on it. Thank you. great exactlt what we wanted ,and it compliments all the bedroom furniture well done. ypur delivery man was good and a compliment to your firm. ADJ. Well made, good looking, hinged lidded blanket/shoe box is the business in my household. Well made, beautiful, just what I wanted. Would def recommend. Received a large blanket box this morning. Just unwrapped, it is really beautiful and so well made. Goes lovely with the oak furniture I already have. Thank you. Would definitely recommend. Very pleased with the blanket box which was well packaged. 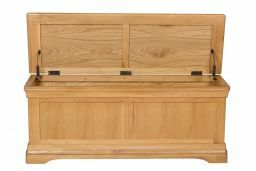 An attractive piece of furniture yet solidly built. Excellent hinges on it too. Would not hesitate to buy other products from this company.